I blame it all on this lady–Mrs. Thelma. She stopped by after breakfast with a newspaper article she thought I might enjoy. The article was a tutorial on how to make a simple dress out of a pillowcase. Actually, the article was much more than that. It was about an organization called Little Dresses For Africa–a non-profit organization that attempts to send HOPE to orphanages in Africa in the form of dresses. I was smitten. I wanted to help. I thought my girls could help. And it even sounded like a really fun craft!! So we headed off to our favorite thrift store with Mrs. Thelma right after breakfast. We hit the jackpot on pillowcases. Some we saved to actually use as pillowcases, I sent one set off to my mom as they were monogrammed in a “B” (my maiden name is Buchanan), and the rest we used for pillowcase dresses. Cut off the top edge. 2. Mark the arm holes in pencil. Do this to each side. 3. Cut out the arm hole on each side. 4. On the neck opening, fold over and stitch a casing for a 6 inch piece of 1/4 elastic. 5. Thread the elastic with a safety-pin, and sew in place at both openings. 6. 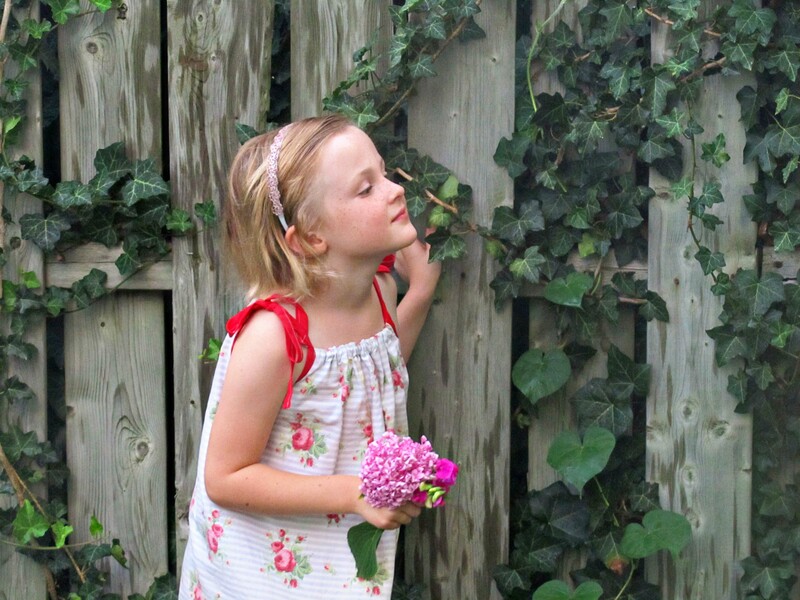 Use double fold bias tape to finish the arm hole and make straps for the little sun dress. 7. After making one for your girlie (or have her make her own), make a few more for Little Dresses for Africa. You can learn more about this organization at their website. And for those of you who are reading to see cooking, I am finally going to get to that part of the post. BEAN AND BEEF BURRITOS (pg. 66) a la Pioneer Woman coming right up. Pioneer Woman calls for ground beef. However, I had some left-over pot roast in the refrigerator, so I used pulled beef instead of ground beef. Ree’s recipe then makes up two burritos with beans, beef, and grated cheddar. Dump some El Pato over the burritos and pop them in the microwave for 2 minutes. Presto! Bang-o! Meal-o finished! But I wanted something a little more to go with my burrito. Perfection!!! Just give me a spoon! I (heart) avocados! And I (heart) guacamole. GRILLED CORN GUACAMOLE (pg. 90) I grilled the corn on the grill (Duh! where else do you grill corn???) Moving along. Add onion, garlic, tomatoes, jalapeno, salt, cumin, lime, cilantro, and stir gently. The tomato sauce on the burritos has a kick to it, so we needed something to cool the edge. 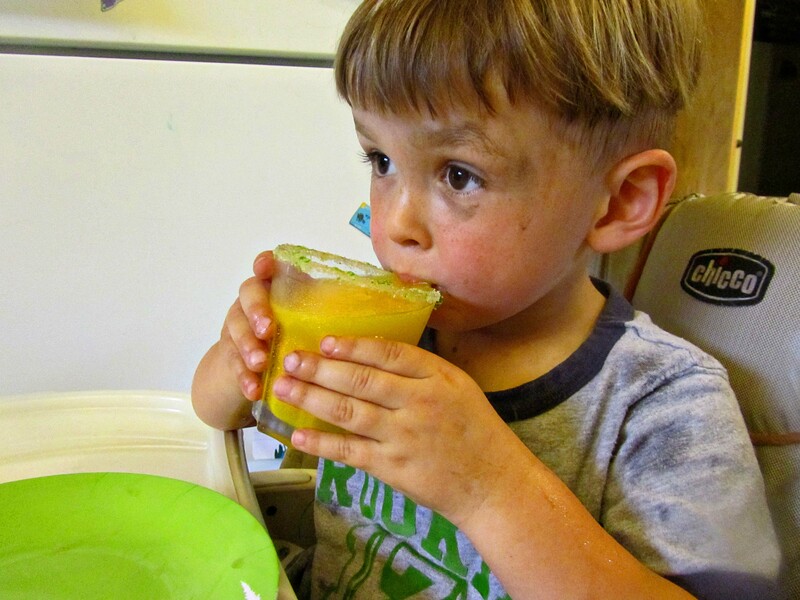 MANGO MARGARITAS (pg. 116) coming up. 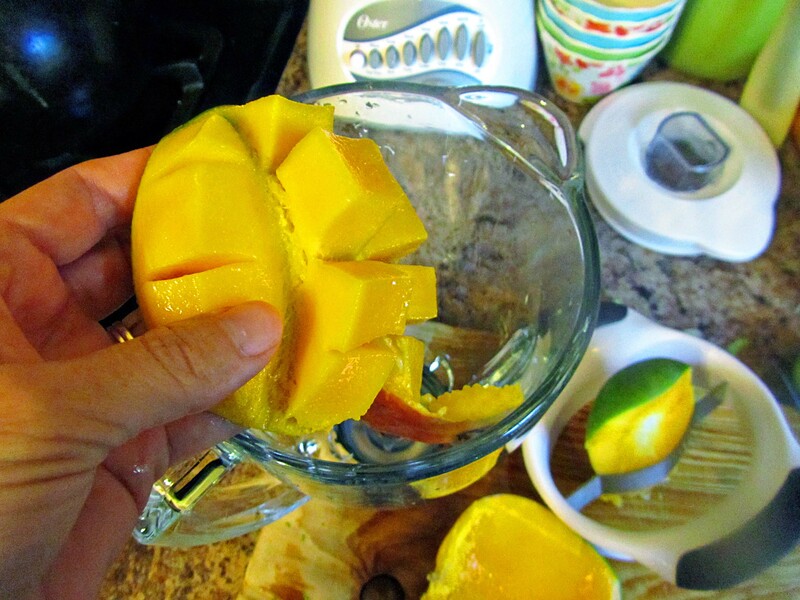 I already mentioned how much I love this mango slicer by Oxo. Let’s use it to slice up some fresh mangos. 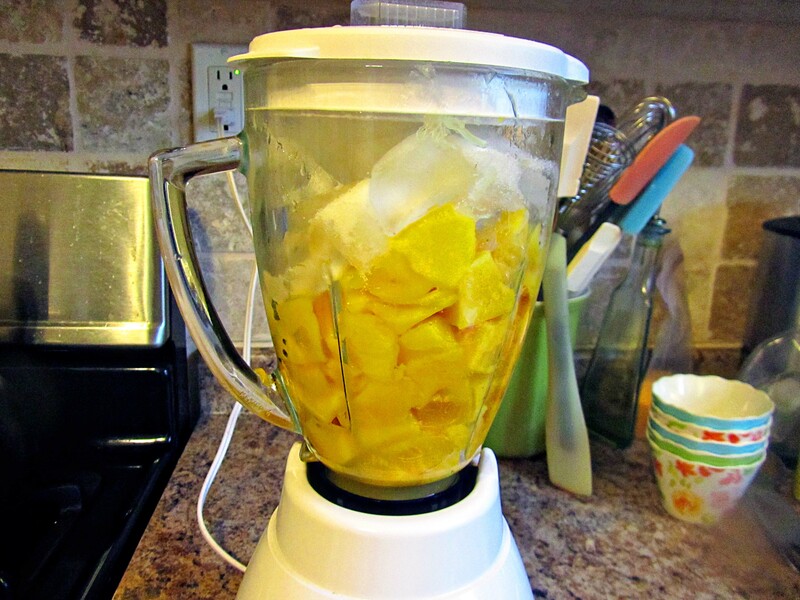 PW uses canned mangoes, but I had some fresh mango ripening on my countertop. 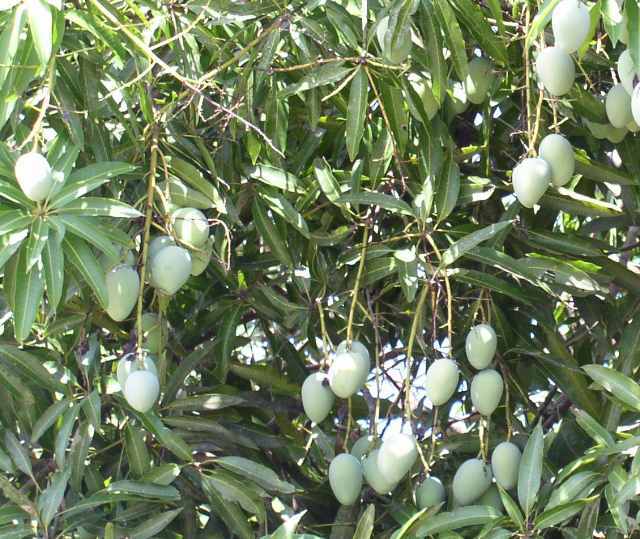 Mangos grow on an evergreen tree in the tropics. They are attached to the tree by a long “string”. Ripened mangoes on a tree almost look like ornaments adorning the tree. I remember the first time I saw a mango tree was shortly after The Hunni and I were married. We were in Brazil over our Christmas vacation (We were teaching in Ecuador), and had been invited over for a Cook Out. The mango tree was beautiful, and we were seated under it for our meal. I asked our host if the mangos ever fell out of the tree, and no sooner than I had finished when a mango dropped right on top of The Hunni’s head. He said it rather hurt. He was hit by one more dropping mango before the meal was over. Although PW’s recipe didn’t call for it, I added some lime juice with the water. I did not have coarse sugar, so I just used my wonderfully-refined-tastes-divine white sugar with the lime zest. 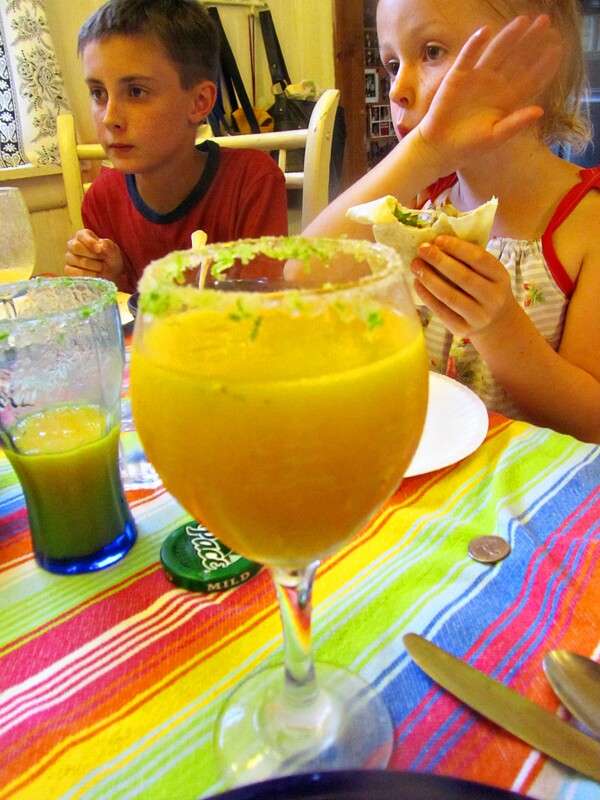 My kids loved the Mango Margaritas, and thought the sugar-n-lime coated rim tasted like Pop Rocks. And this grumby chubby loved it. 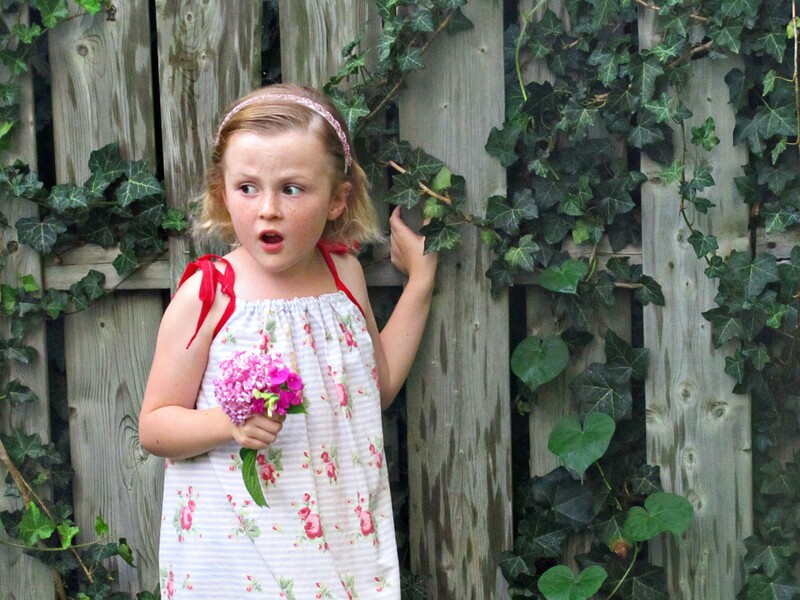 With our Mexican Meal over, we headed outside for a photo shoot of the pillowcase dresses. Eloise usually has some drama that she reserves just for photo shoots. I wonder who the Handsome Prince is? Somewhere along the way I decided that I wanted to make up 40 pillowcase dresses for a craft for the Children’s Hour at a family, christian, summer camp we attend in Michigan. My sister-in-law came to the rescue and made half of them for me. Thanks a million Lily! P. S. I also picked up these napkins during my thrift store foray. Love them! 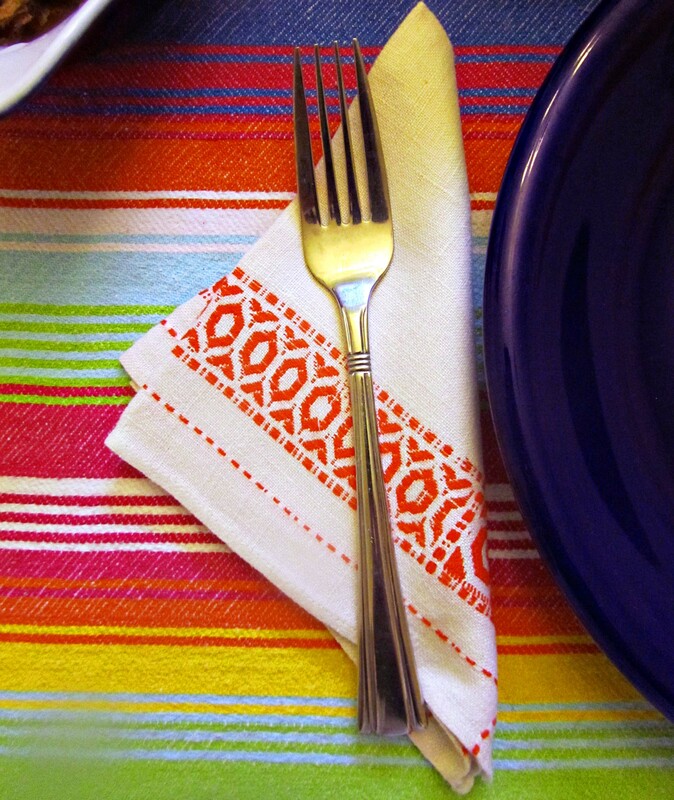 And perfect for Mexican Food. The internet guy is coming today!! Hopefully, I will get some better internet service. Last night The Hunni told be that our phone box had filled with water from a dripping icicle, and had then frozen. The box had popped open as the ice expanded. I wonder if that had anything to do with our service? 🙂 So once again, forgive the typos as I can’t type for more than 3 minutes without everything shutting down. 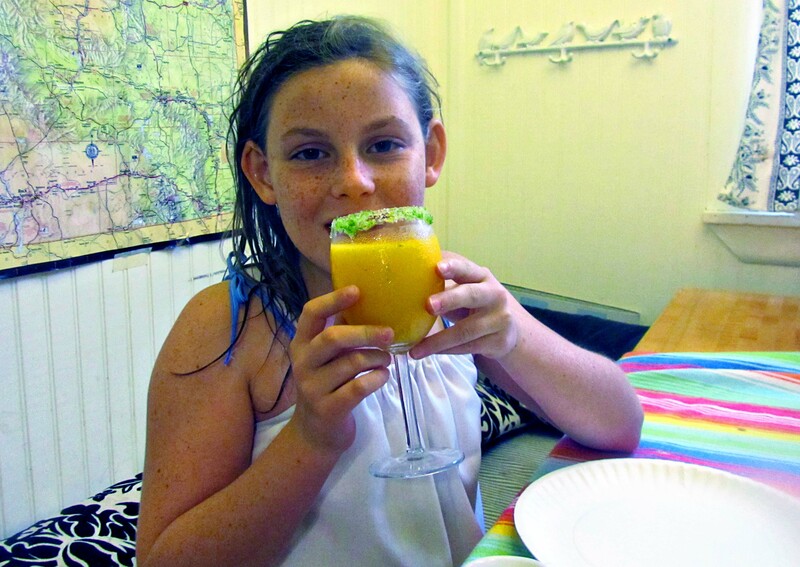 This entry was posted in Recipes and tagged little dresses for africa, pillow case dresses, pop rocks. Bookmark the permalink. Wish I would have saved the pillowcases my Mother embroidered. These dresses are really cute. They are an easy sewing project for a young girl. I am sure that they wer beautiful. Now that’s the way to cut up a mango! I tried doing that once and it turned to total mush! It does have to be slightly firm. I’ve “mushes” several myself. And your new clean site is making me think I should do a clean up. Go for it. Also you should be able to do rotating random header images in your settings somewhere. If you can’t change the theme! Do it – its like starting the year fresh! I am sure you are right, however, it seems a bit like cleaning house at the moment. I did get a good book from the library over the break on WordPress. It is due back, but I am going to look into the rotating header. What I would really like is a proffesional art job on my header. In fact, I already told the Hunni that is what I want for my 40thh birthday this year. I do need to do something before April, though. Again, your blog looks great. You are a lifesaver because I just unearthed a very pretty pillowcase I bought @ Ikea that is twice the length of a normal pillowcase, so won’t fit average pillows. I always wondered what to do with it, and this sewing project is at my skill level. Hope your computer troubles end soon. AT&T came! Now I realize that not all my troubles were internet related, but that I need my actual computer cleaned up a bit. This bugs me as it is only a year old. I hope you enjoy the sewing project. For some reason, I really enjoyed this porject. I think because I thought of a little girl in Africa getting a new sundress, and it made me happy.